Here's to the start of summer! Memorial Day Weekend always feels like the gateway to the year's sunniest season. While most families head to the beach for a long weekend getaway, mine decided to keep things low key this year with a road trip into Western Pennsylvania. 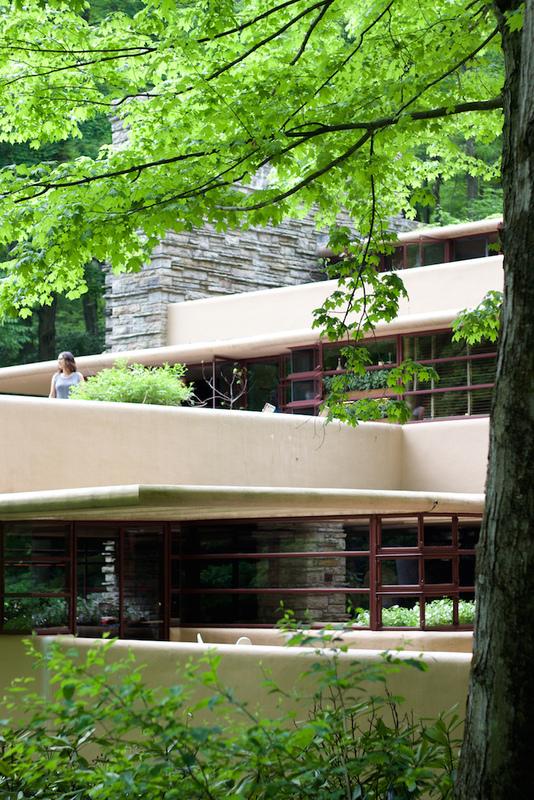 The first leg of our trip was an art lover's dream, with a stop at American architect Frank Lloyd Wright's famous Falling Water house. This visit had been on our family's list for years, and we quickly concluded that it was worth the wait. 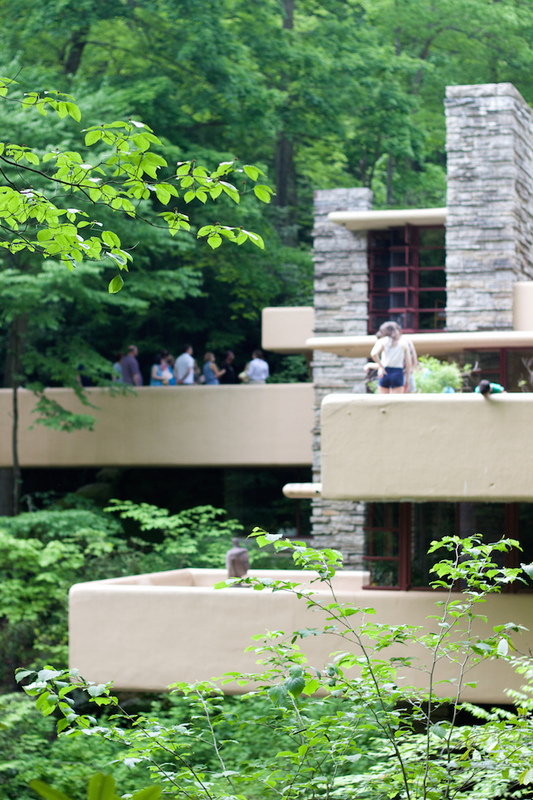 Wright's work was always focused on an organic harmony with nature. 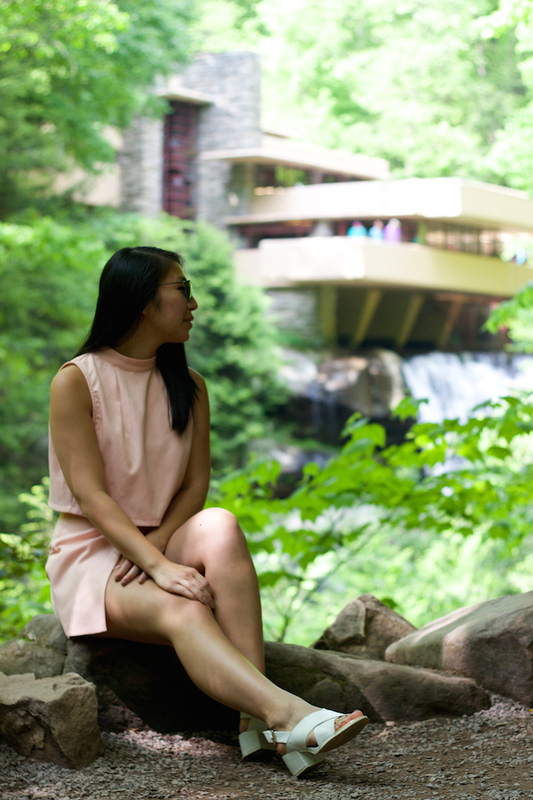 He believed in the synthesis of architecture and the environment surrounding it, as clearly shown by Falling Water's seamless integration into the boulders, trees, and waterfalls. We unfortunately could not take photos inside, but I highly recommend that any art lovers reading this take the trip one day. To simply describe the home's beauty and carefully constructed details will never do it justice. Stay tuned for photos from the second half of our trip! Ahh it looks so lush and peaceful there! Harmony with nature indeed. Love your outfit as well! That two piece is gorgeous! I love the color! Love your pretty dress!! Beautiful pictures!! Beautiful place, really seems peaceful! You look gorgeous and so chic! perfect look for this HOT HOT weather! That place looks incredible. You look stunning, Christina. Awesome place!! Your look is also fantastic!! I love waterfalls. This place looks peaceful. Love this romper on you. The place looks so amazing and I just love your look. I love your look so much, the color is amazing! The expert organizations with their immense experience are connected with us to serve client with full fulfillment in #India. These packers movers organizations in hyderabad gives residential and worldwide pressing moving arrangement. Amazing pictures, place and look! Really wonderful! I'd love to see this in person. 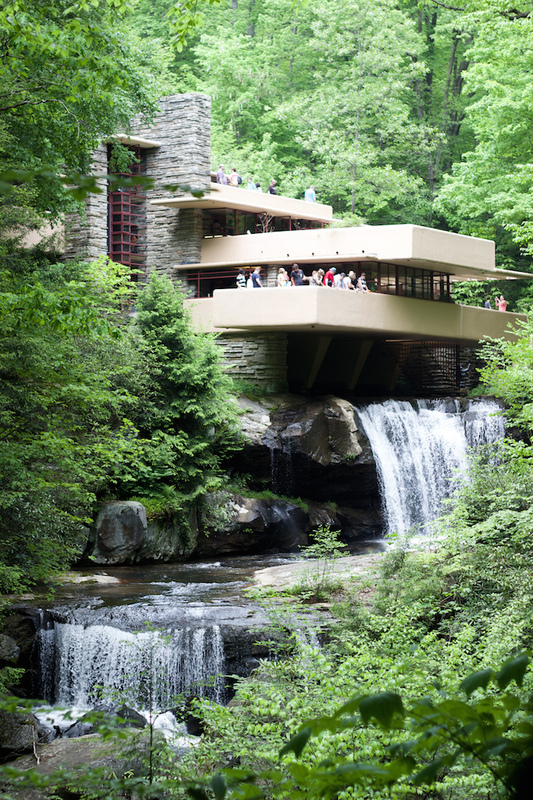 So jealous that you got a chance to see falling water! What a masterpiece. Experienced packers together with movers Hyderbad based companies may also give some other sort of distinct offerings on your require. storage devices service together with car insurance company & transportation service. You looking so pretty in this dress thanks for sharing with us here is more information for me I really love it. Thanks. Indian Packers and Movers in Mumbai give packing and moving services like loading & unloading, packing & unpacking, car carriers,transportation, domestic &local shifting, international shifting, Industrial shifting, corporate shifting, Warehousing, etc. Packers and Movers in Mumbai achieve conceit in offering great packing and moving services at reasonable costs. We deal all types of packing and moving services in Mumbai and other main cities of India. inexpensive rate. Getting the finest deals for secure, safe and cost competent shifting is enormously easy and that can be availed with slight hard work of online search.Packers and Movers in Mumbai as a company provides wide-ranging services for your entire shift. If you are looking Best Movers and Packers in Mumbai then Indian Packers and Movers in Mumbai is the right place to fulfill all your packing and moving shifting services needs.Having the industry experience and expertise, our services are offered for home,business and local shifting, corporate and domestic relocation, car transportation services to our clients. We provide best Packers and Movers services in Mumbai very affordable price. I was glad to reveal this extraordinary site. I have to thank you for your opportunity because of this awesome read!! St Patrick Day 2018 I certainly delighted in all of it and I have you bookmarked to see new data on your blog. We all know there are in total Seven Wonders of the World and Taj Mahal is at number one in that list. You should not miss the chance of visiting one of the Seven Wonders of the World. Because not everyone get the chance of visiting the Wonders of the world. If you wish to solicit a mover, it's to take advantage of the services of the moving specialist .One of the best movers and packers in dubai the PERFECT Movers in Dubai. Contact us for our services. We will never disappoint you. Certainly, but not just! Listed here are additional services that you might want to demand more comfort when altering your way of life.